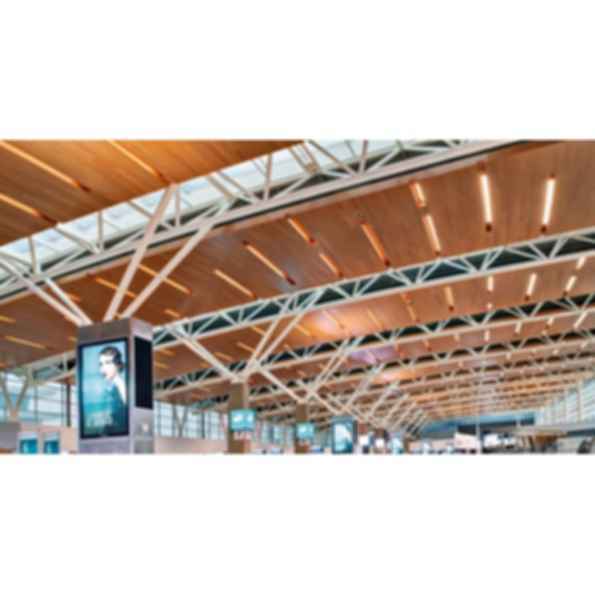 Adding the warmth of wood with exceptional sound absorption properties, Decoustics' Solo acoustically perforated panels and planks are an excellent choice for a variety of both ceiling and wall applications. Solo is available as a panel (Solo-M), plank (Solo-P) and dark core (Solo Dark Core) with a number of grooving options to help you achieve your design intent. Solo-M and Solo-P are constructed with perforated no-added urea formaldehyde (NAUF) medium density fiberboard (MDF) with a natural wood veneer laminated to the face and an acoustically transparent black mat to the back. Although the percentage of open area of Solo is approximately 6%, the unique v-grooves create a two sided "funnel" effect that allows sound to be absorbed at a variety of angles thereby focusing the transfer of energy over a broader surface area of absorption material. Absorption characteristics can also be modified by changing the substrate thickness. The perforations virtually disappear at a distance, giving the appearance of a monolithic wood ceiling or wall installation. All Solo products are manufactured for a precise fit, delivered on site fully finished and ready for installation.